We've got you covered, every step of the way. Transport Graphics has been the trusted choice in vehicle wraps and fleet lettering since 1991. We have sought to control the quality at every step of the process. This is why we do our own designing, color management, printing, finishing & installation. We have set out to get the certifications that matter to ensure you get the peace of mind you require. Designing graphics for a vehicle is far different than designing graphics for traditional print media. Even designers of large format graphics may have issues designing for a three dimensional object with curves and obstruction. Thankfully we have a team of full time designers who specialize in vehicle wraps along with the experience to maximize your impact. We also have access to the industries newest fonts, art, and vehicle templates. Transport Graphics has been on the cutting edge in color for 25 years. When we installed our state-of-the-art 6 color HP Latex printers, we had just 1 problem. We had these brand new printers and the same old color matching system. We were frustrated by the limitations of a system that didn’t fit our shop. Because of this, we created our own color matching system. We have state of the art RIP software and custom calibrated print profiles. Our color tools like our spectrophotometer have allowed us to calibrate our monitors and printers to give us industry leading precision. Accept nothing less. Transport Graphics prints and finishes our graphics in house. Our goal has always been to offer our customers the highest quality products to fit their needs. A wrap can be done with a lower grade vinyl and it can be made to look good long enough for the check to clear. Our commitment extends to the life of the product. 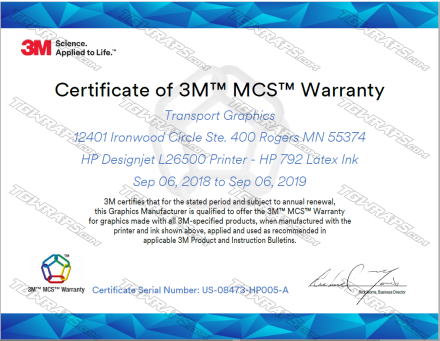 We are a 3M™ Authorized Graphics Manufacturer and are 3M™ MCS™ Warranty Certified. MCS stands for Matched Component Systems. 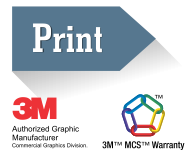 This is 3M’s premium warranty and extends beyond the film into our printing and finishing. Our commitment is reflected in our state of the art HP Latex Printers and our use of the highest quality films and laminates in the industry. Premium graphics can only stand the test of time when installed correctly. We helped set the standard for vehicle wraps in the state of Minnesota. 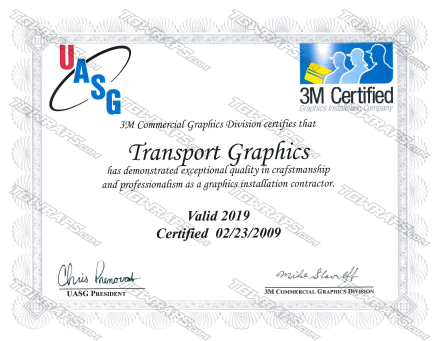 Transport Graphics was one of the first 3M Certified Installers in Minnesota. We have 15,000 square feet of indoor climate controlled shop space. Our internal training program meets or surpasses the standards set by manufacturers. We are always refining our techniques and expanding our vast knowledge of vehicle wrap films. When you want the best, accept no less than Transport Graphics.